You are currently browsing the tag archive for the ‘sparks’ tag. I completely forgot to mention in my previous blog post that, in between my trip to Washington DC & now, I had gotten sick. I mean, I was “can’t-get-outta-bed” sick. That’s how sick I was, & after I recovered, I had kind of become lazy & stopped writing for a hot minute. Now I’m back, & I’m here to tell you that I went to yet another concert at the Fox Theater in Oakland, California. We stared our evening grabbing a quick bite from the Off the Grid food truck stalls outside of the venue. We nearly missed our concert, as we had forgotten to put a calendar alert on our smartphones. Luckily Jian’s phone beeped that morning, or we would have missed this epic night. I ate at one of my favorite food trucks, called…dun, dun, dun…BACON! The best damn freshest bacon in town. Against Jian’s wishes, I bought more concert tickets for this venue. 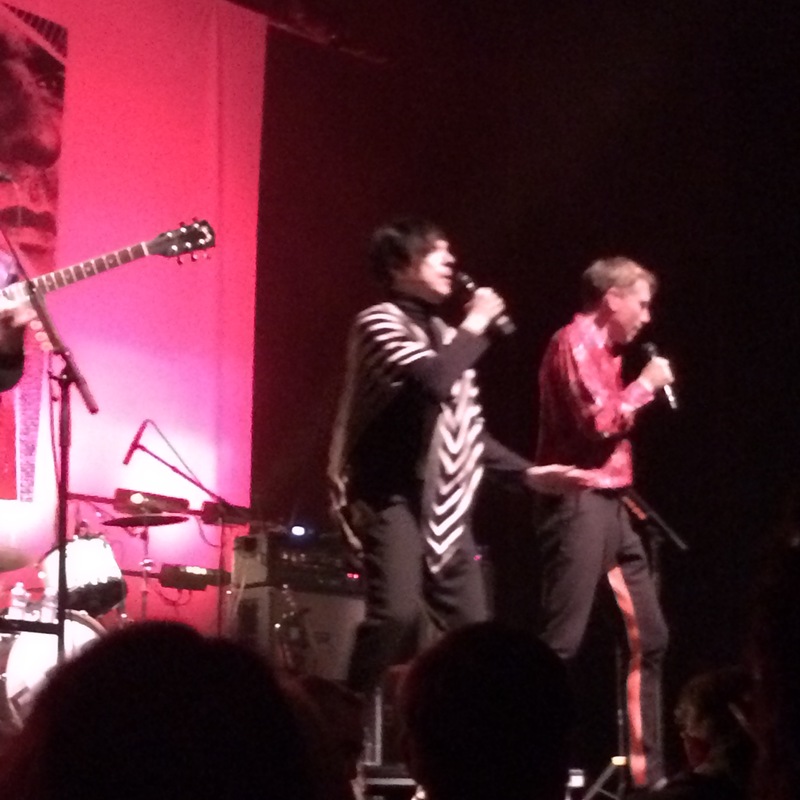 This time we went to see the Scottish rock band FRANZ FERDINAND perform as a collaboration super rock group called F.F.S. with the popular American rock group, SPARKS. It’s crazy how fast this collaboration band came to be. These two amazing rock bands had only just formed one mixed band this past March (2015). They quickly released two singles & a full-length album by April, & was already making plans to tour around the world in the same year. I had no clue who the band SPARKS was or just how popular they were, but I had been a long-time fan of FRANZ FERDINAND & knew of their popularity for sure. Who knew that these two bands have already been collaborating together since the mid-2000s??? So. Cool. Steering the topic back to the concert itself, this time I had bought standing-floor tickets. We were able to stand extremely close to the stage, & we were lucky enough to be standing in the area that got the most band attention. How much attention, you ask? 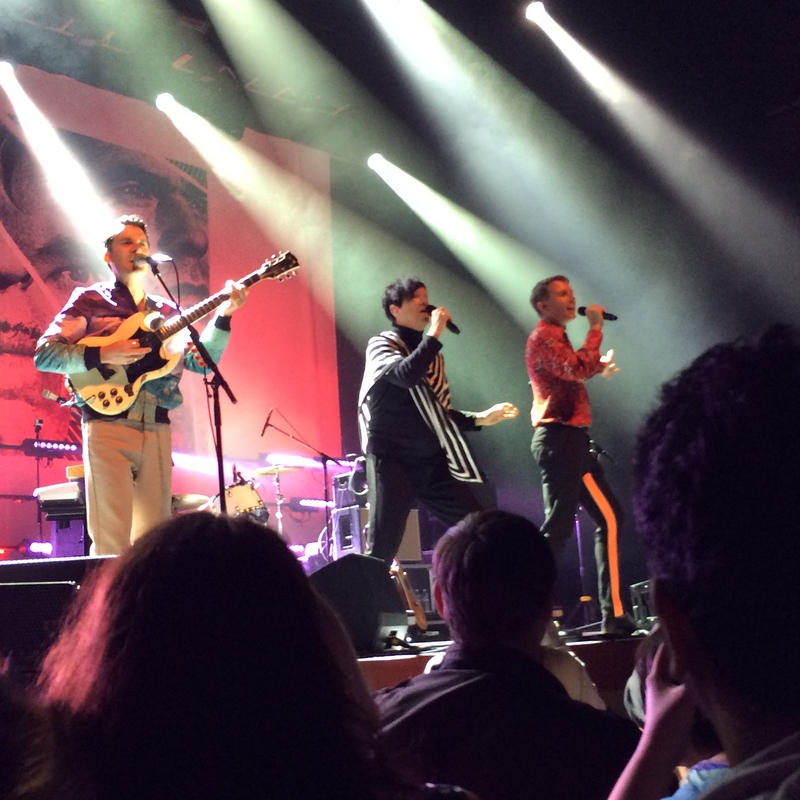 Well, let me tell you this, Alex Kapranos & Russell Mael,of FRANZ FERDINAND & SPARKS respectively, constantly would walk/dance over to our side of the stage & high-five the girls smashed up against the safety railing. Also, guitarist Nick McCarthy stage-dived, crowd-surfed, & jumped down into the audience only on our side of the stage. The time Nick jumped down into the crowd, he moved all around amongst the audience & danced along with us while playing his guitar, all without missing a beat. The one time he stage-dove right into the audience, he nearly landed right on top of me. Now, I’m quite a petite lady standing only at 5-feet tall (152cm). How am I supposed to carry the weight of a generously tall man playing a guitar over my head? (Unless I’m some beefed-up bodybuilder, I don’t see that happening.) Seeing Nick stage dive right into my side of the crowd scared me a bit, so I side-stepped out of the way when his crowd-surfing body was headed in my direction. Luckily Jian was standing right next to me & was able to guide Nick & his sleek cream-colored guitar away from our general direction before he headed back towards the stage. Throughout the night I kept my eyes trained on co-lead singer Alex Kapranos. Boy, is he attractive looking up close & personal. I was watching the way he enthusiastically danced on stage, & I kept thinking to myself, “Alex’s dancing & stage presence reminds me of a cross between David Bowie & Brandon Flowers.” He was really making good use of his extremely slender legs & his long arms with his flailing dancing around on stage. I also couldn’t help but notice that Alex’s hands were H-U-G-E!!! His fingers were impossibly long & slim (he could’ve held my entire head with just one hand). In general, Alex Kapranos is just a tall, slinky, svelte individual. I don’t think he carries even one ounce of body fat on himself. As for Ron Mael, the other co-lead singer, I was curious as to why he chose to wear a turtle neck shirt & a poncho on stage. In fact, I was wondering why he wore all-black clothing at all. It must’ve been really hot for him on stage. The venue didn’t have very good air conditioning, even though it was a rather mid-sized concert hall. Overall, both singers did a fantastic job taking turns being the lead singer on stage. They really knew how to ramp up the crowd’s excitement. Overall, I had a blast at this concert!! 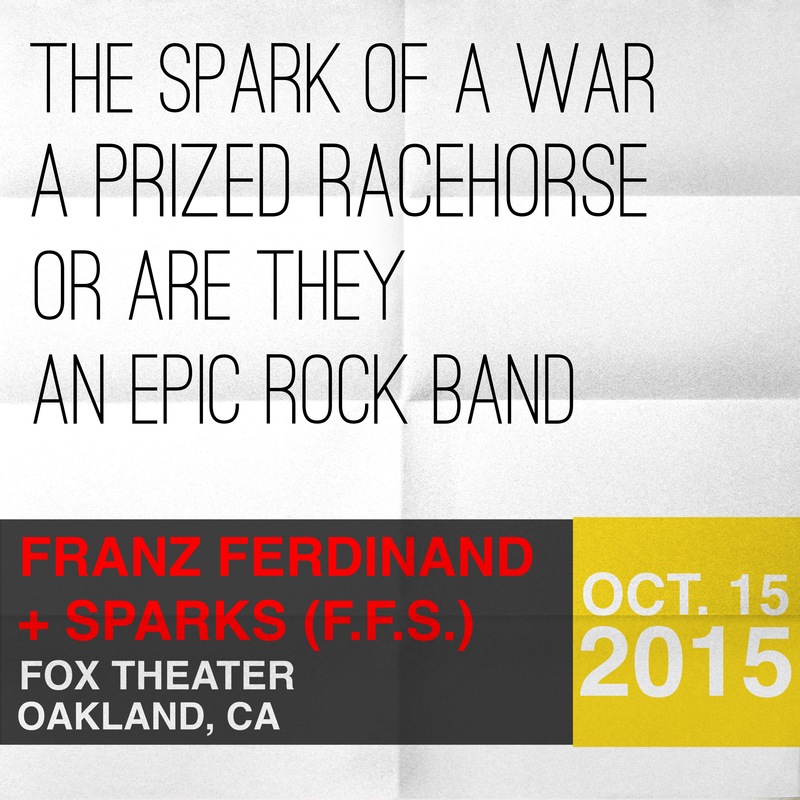 I love Franz Ferdinand, & they did an excellent job collaborating & joining forces with Sparks. 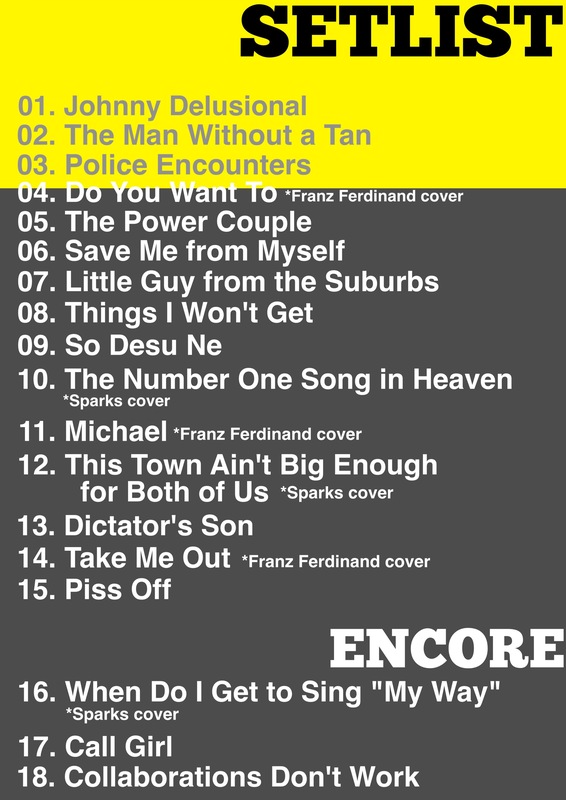 I can’t wait to see Franz Ferdinand in concert again. Cheers!